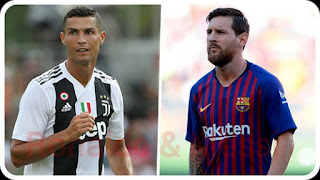 Football is one the most richest sport in the world , Forbes have recently published the list of top 100 highest paid Athlete in the world and there is only 9 footballers included on the list. Lionel Messi and Cristiano Ronaldo have dominated the football world for many year now , they remain on top of the list in the past 10 years. The Argentine international is top of the list for the first time in his illustrious career , he earned $667,000 a week plus winning bonuses. Brazil international Neymar Jr move to third after signing a lucrative contract with Paris Saint Germain. Lionel messi is the highest paid player in the world, the Argentina international earn the sum of $111 million a year , he earn $84 million from salary and another $27 million from endorsement deal, he is the second highest paid athlete in the world after Floyd Mayweather. The five time Ballon d'or winner join Barcelona age 13 from Newel Old Boys has been the shining light at Camp Nou since making his first team debut in 2014 against Espanyol , since then he has won 32 trophies with the catalan base club. He signed a new contract in November 2017, a deal that will keep him at Camp Nou till 2020-2021 season. Lionel signed a lifetime endorsement deal with Adidas , he also signed an endorsement deal with Pepsi, Huawei,Gillette and Gatorade , his theme park called Messi Experience Park will be open in Chinese city of Nanjin in 2020. The Portuguese international is the second highest paid footballer in the world in 2018 according to Forbes, he earn $61 million annually from his salary and $47 million in endorsement deals . Ronaldo who is the world famous footballer left Real Madrid at the end of last season to Italian heavyweight Juventus for a transfer fee worth €112 million where he will earn a reportedly €120 million for the duration of his contract. The 5 times Ballon d'or winner who won his fifth champions league title with Real Madrid last season signed a lifetime endorsement deal with kit manufacturer "Nike" worth $1 billion, he also signed with EA Sport and Herbalife, he is also the CEO of CR7 Branded Product which deal with shoes and fragrance. Neymar Da Silva Junior , popularly know as "Neymar Jr" is the world third highest paid footballer making a total $90 million yearly , he earn $73 million from salary and winning bonuses and additional $17 million from endorsement deals. 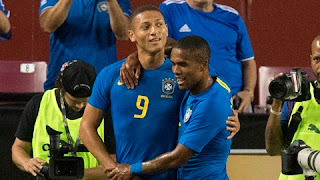 The Brazilian grab the headline in the summer of 2017 when he announce his intention to leave Barcelona for French giant Paris Saint Germain , the deal went through when the French club agreed to pay a world record transfer fee of €222 million and Neymar Jr pen a 5 years contract which will keep him at he club till 2022. Neymar Jr also sign an endorsement deals with sportswear manufacturing company "Nike" ,energy drink company "Red Bull" and McDonald's which give him a combine $17 million annually . Wales international Gereth Bale is the fourth highest paid soccer player in the world , he earned $34.6 million yearly, $28 million from his salary and another $6 million from endorsement deals. Gereth Bale whose two goals help Real Madrid to their third consecutive Champions League title against Liverpool in May , signed a contract extension in November 2016 , a contract that will keep him at the Santiago Barnebeu until the end of 2021-2022 season. He also signed an endorsement deal with German sportswear manufacturing company "Adidas" which fetch him the sum of $6 million yearly . Manchester United midfielder Paul Pogba is the fifth highest earn football player in the world, he earned $29.5 million a year. The French World Cup winner who is in his second spell with the Red Devil earns $25 million from his annual salary . He also signed 10 years deal with German sportswear manufacturing company "Adidas" where he earns $4.5 million per year. The Brazilian international popularly know as "Oscar" ply his trade in the Chinese Super league , he joined from English premier league side Chelsea in the summer of 2016 . The 27 years old pocket $515,000 weekly wages which is $25.9 a year plus bonuses. He also earn $1.5 million from his endorsement deals. Former Manchester United midfielder Wayne Rooney end his 13 year spell with the Red Devil and returned to his boyhood club "Everton" in the summer of 2017 where he accept a huge pay cut to complete his dream move . After a season with the Merseyside blue , the 32 year old move to MLS with Dc United where he signed three and a half year contract , he earned $22 million per year including bonuses. He also signed an endorsement deal with sportswear manufacturer Nike, Samsung , EA Sport and Harper Collins. Uruguay international Luis Suarez is the eighth highest paid football player in the world. The 31 year old who join from Liverpool in the summer of 2014 , renewed his contract on December 2016 which keep him at Camp Nou till the end of 2020-2021 season, the deal worth $20 million per year . He also has an endorsement deal with sportswear manufacturing company "Puma"
Manchester City legend Kun Aguero is undoubtedly one of the best striker since his arrival from Athletico Madrid in 2011. His goal scoring prowess saw him offered a new and improve contract worth $17 million a year at the Etihad. He also has an endorsement deal that fetch him $6 million yearly. Olympic gold medalist Angel Di Maria is rated the tenth highest paid soccer player in the world by Forbes. He joined Paris Saint Germain from Manchester United where he signed a 4 year contract worth $20.6 million per year. He also earn $2 million from endorsement deals. That is a great information..these players do have great skills too.